Editor/Author Hanlon, Geoff and Hodges, Norman A. 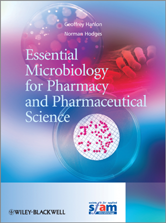 This text is an essential study guide for undergraduates studying microbiology modules on degree courses in pharmacy and the pharmaceutical sciences. Written by two pharmacists each with over 30 years experience of teaching, research and publishing in pharmaceutical microbiology, it distills the subject down into the essential elements that pharmacists and pharmaceutical scientists need to know in order to practice their profession, and it covers all the microbiology components of the Royal Pharmaceutical Society's indicative syllabus that is at the heart of every UK pharmacy degree.